Yeah, I know, most of the world doesn’t like or use the parking brake any more. Yet, some of us still prefer a manual transmission for the driving experience — and rely on the parking brake. So, what happenswhen someone does not set the brake completely? We need a roll arresting car parking stop. Like many in Colorado, our home has a sloping driveway. Not a huge slope, but enough. Though we have a good size garage, the truck scrapes the door when pulling in. Unfortunately, the truck gets to live outside. The same is true for my son’s car — it parks on the sloping driveway. OK, I’ll admit it. The garage is also the workshop, so most of the time only my wife’s car gets a space. And, she deserves it. Why The Need For A Car Parking Stop? While we love the beauty and simplicity of a manual transmission, the one annoying problem is the lack of an easy way to secure it. I’m not sure the history, or why it’s not also in manual transmissions, but the Park function of an automatic is the one piece I’m jealous of. Parking brakes are notoriously poorly designed, and engine compression is not robust for many situations (like on a hill). So, how does the car stay put? We found out just how unreliable the situation can be one day when we found the car out in the street. Apparently the brake was not set sufficient, and overnight the car rolled slowly down the drive and into the street. Time for a reverse car parking stop to compensate for user error. Normally a car parking stop is in front — like in parking lot. The stops, or bumpers, or barriers, are there to position the car and so the driver knows when to stop. So, should we do one in reverse? To do that, the car must first drive over it, and each time it leaves, it will drive over it again. That means the parking stop must be strong. Laying a 2×4 across the drive works mostly, but it is not enough to keep the truck there by itself. We need something a little taller. 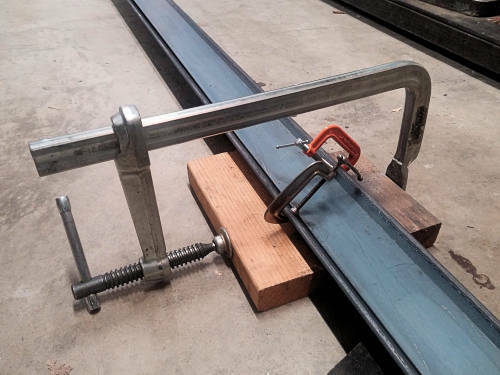 As an experiment, a simple piece of steel angle was tried, and it worked. After several drive overs with the truck, the angle no longer was a 90 degrees. Since the point of experimenting is to learn, the experimentation was very successful. First we know the 3″ L-Angle works, yet second, we now know the angle by itself will gradually flatten out. Of course we could go to thicker, heavier angle, but how much more? Perhaps it’s best to just sidestep the issue and make a triangular tube. The design and the build are super easy. 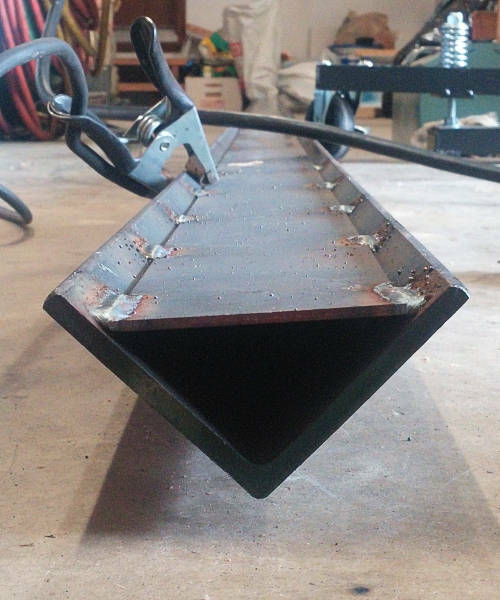 Just lay the flat piece of steel into the open side of the L-Angle, then weld. Stitch weld along the sides every 6″ or 8″. That’s it. For reference, this is 3″ x 3″ x 1/4″ Angle with a 3″ x 3/16″ Flat piece inside. It is 18′ long to cover two car positions. The weight is sufficient that it doesn’t move around on the driveway, then placing one edge in the crack helps too. The only trick with construction is making the pieces stay in place, upright. In the photo you can see adding a couple blocks on either side of the angle held with a large clamp makes a perfect cradle. 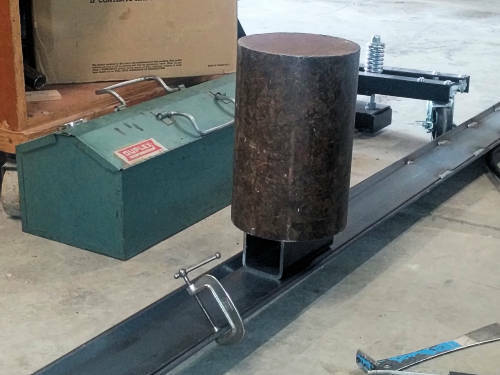 A few small clamps kept the flat piece from moving. You might think just setting the flat stock in is enough, but it’s not. Welds are funny because they make things move. With this car parking stop across the driveway, cars parking there won’t roll back. While it’s enough to keep things from rolling — even when in Neutral and no park brake — it’s also not too high to simply drive over it. Problem solved. This Solutions! category of our tips library is for you. We want to see your fun solutions as well, so please take a minute, get a few photos, and tell us your story. Use This Page to Submit. Write up just a little about your work, then we’ll share it just like the car parking stop. Thank you for visiting.